A new study led by researchers at the Johns Hopkins Bloomberg School of Public Health finds that in the event of a flu epidemic caused by a novel virus, using pharmacies to administer flu vaccines could save thousands of lives and billions of dollars. Millions each year already get their annual flu shots at pharmacies. In the event of an influenza epidemic involving a virus that has not been seen before, such as during the 2009 H1N1 flu pandemic, getting enough of the population vaccinated as soon as possible is particularly important to reduce the spread and impact of the virus. Traditional health care locations alone, such as doctors' offices and hospitals, may not have the capacity or convenience to get enough people vaccinated. Using a computer simulation model, the study found that adding pharmacies as locations that dispense flu vaccinations during a mild epidemic averted up to 17.1 million symptomatic cases, prevented up to 104,761 deaths and saved $1 billion in direct medical costs, $49.3 billion in productivity losses and up to $50.3 billion in societal costs (direct medical and indirect costs combined). In a more severe epidemic, adding pharmacies averted up to 23.7 million symptomatic cases, prevented up to 210,228 deaths and saved $2.8 billion in direct medical costs, $97.1 billion in productivity losses and $99.8 billion in overall costs. The findings were published online Oct. 16 in the journal Vaccine. The study was conducted with researchers at the Walgreens Center for Health & Wellbeing Research. Johns Hopkins Medicine supports the Walgreens Center for Health & Wellbeing Research through academic collaborations. Annual flu vaccinations are recommended, but the majority of people in the U.S. don't get vaccinated for the flu. According to the Centers for Disease Control and Prevention (CDC), in 2017, nearly half, or 47.8 percent, of children ages six months to 17 years and 33.8 percent of adults ages 18 to 49 received a flu shot. The more people who go unvaccinated, the higher the risk of individuals getting sick and spreading the flu, which could in turn cultivate an epidemic. "Pharmacies offer a potentially more convenient alternative to health clinics and hospitals to get vaccinated," says Bruce Y. Lee, MD, MBA, executive director of the Global Obesity Prevention Center (GOPC) at the Bloomberg School. "A pharmacy may be closer to you than your doctor's office or a hospital. Moreover, if pharmacies are open later, then people have a wider window of time to get vaccinated, such as during evenings, weekends and other non-work hours." For the study, the researchers developed a detailed computer simulation model of the United States to simulate different flu epidemics and to show the costs and health effects of utilizing pharmacies in addition to traditional locations that provide vaccinations. The model used data from a variety of sources including the United States Department of Agriculture Economic Research Service, National Household Travel Survey, Healthcare Cost and Utilization Project, CMS Physician Fee Schedule and other national databases and included six types of vaccination locations (e.g., hospitals, urgent care centers, physician offices, pharmacies) across the entire U.S. population. The model included virtual representations of all people in the United States and their daily activities and interactions. Each virtual person could get the flu shot at any nearby location with available doses. 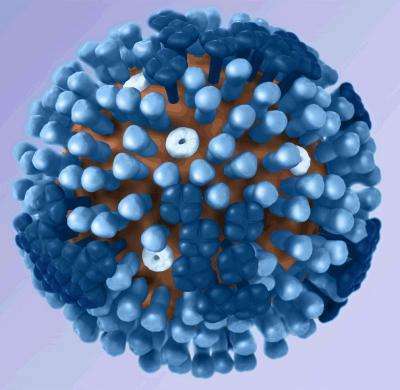 A virtual person infected with the flu virus could transmit the virus to others. The shot reduced a person's chances of getting the flu. The clinical flu cases were then translated to their corresponding health and cost outcomes. Different experiments simulated pharmacies distributing vaccines in two ways—one with typical store hours, and the other, with extended hours. The research team found that traditional health care locations were able to vaccinate 23.8 percent of the population immediately after a flu epidemic started. The subsequent societal costs due to missed work days and medical bills totaled up to $158.4 billion for less severe cases and up to $315.4 billion for more severe cases. "Our study shows that dispensing flu vaccines at pharmacies in addition to traditional locations can save third-party payers like insurance companies and Medicare billions of dollars and save businesses billions in productivity losses," says Sarah M. Bartsch, MPH, GOPC faculty and lead author of the study. If the pharmacies were to extend their hours, up to 16.5 million cases and up to 145,278 deaths could be averted, and as much as $1.9 billion in direct medical costs, $4.1 billion in indirect costs and $69.5 billion in societal costs could be averted. Results from this study could inform public health policy and decision-makers including policymakers, government entities, insurance companies, pharmacies, health care professionals and other businesses and employers to determine how much time, money and other resources should be invested into distributing and allocating vaccines to pharmacies prior to or during an epidemic. "History has shown that another flu epidemic will occur," says Lee. "It is just a matter of when. Our study shows that when it comes to a flu epidemic, location and convenience matter a lot. Adding pharmacies as vaccination locations could end up saving thousands of lives and billions of dollars depending on the severity of the epidemic."